www.mantecabulletin.com under the Opinion section. In response, I wrote this letter to the editor of the paper. Let's hope they publish it and I get an opportunity to talk to some of that local church groups. The pastor of the church that demonstrated that night has declined my offer. My name is Matt McCormick. I am the professor who gave the lecture to the Stanislaus Humanist group at the Manteca Library on January 15. I’d like to thank the Stanislaus Humanists for inviting me to speak. And I’d like to thank all of the people from Manteca who came out either to hear me speak, or to participate in the events outside the building that night. My lecture has stirred up quite a bit of controversy. I’d like to present a few thoughts on what I take to be a fundamental issue, and I’d like to make an offer to any churches or other groups in Manteca. The most fundamental requirement for a successful democracy, and for human prosperity and happiness, is for individuals to, first, be informed with the full range of relevant ideas, particularly concerning important decisions, and, second, for them to have the critical thinking skills to be able to reason clearly, accurately, and reliably about that body of information. In religious organizations, to a greater or lesser extent depending on the tradition, the social model is fundamentally authoritarian; the clergy lead, they shepherd, they give their congregations the answers, they enforce belief conformity, they exclude dissenters, they exclude contrary ideas, they discourage doubts, and they discourage independent thinking. Much of this was evident in the dangerous rhetoric in response to my coming to speak in Manteca. Many of the comments and reactions before, during and after have been dangerous, combative, and confrontational. One pastor, praying about my lecture before I came to town said, “We drive back any atheist movement right now in the name of Jesus. . . We must repel the demonic attack on our city," and he prayed, "God, cause a storm to happen or something [on Wednesday night]." Another pastor said that I was an "evangelical atheist," and "they're going to try to put up billboards, they're going to try to do other things to convince people that God is not real. . . And, as far as I'm concerned, this is our house. This is our house. This is our city." The social model for a liberal arts education at a university like where I am a professor is fundamentally democratic; my job is to encourage people to actively consider contrary ideas, think for themselves, make their own decisions, be independent, to not blindly trust authority, and to not be manipulated by emotional ploys or rhetoric. Our goal is to get people to reason well. We are neutral with regard to the outcome of that reasoning process; people should be free to draw whatever conclusion they deem to be best supported by sound reasoning and the evidence. Creating atheists is not my goal; I would rather people become thoughtful, rational, well-informed believers in God than have them be dogmatic and irrational. Many pastors, preachers, priests, and other clergy are dedicated to keeping you believing no matter what the evidence is. And they wittingly or unwittingly use a variety of methods to do it that are at odds with your being an independent, informed, and effective critical thinker. Some of them and some of their methods encourage ignorance, superstition, intolerance, irrationality, and narrow-mindedness. We should all be deeply concerned about clergy who would capitalize on the ignorance of people who don't have the critical thinking skills or the information to know any better, to keep them from making thoughtful, informed, reasonable decisions for themselves. On my recent visit to Manteca to speak to Stanislaw Humanists about the resurrection, we had a bit of drama with some local church members. When I arrived at the library to speak, there were 300 or so people assembled outside for a counter-protest/prayer vigil/religious service. They had a P.A. system set up, were playing music, praying, passing out food, and so on. During my talk, among other things, they encircled the building, held hands, and prayed fervently about what was going on inside. A number of them sat through my talk and asked some questions after. A couple of self-described “security” guys came in and out during the talk, had intense conversations on radio headsets, and scowled at me while I talked. A number of them lurked outside the open door to the lecture hall and listened. I invited them to come in and sit down, but they refused. Some others who were passing by shouted into the room later in the talk. And when I walked back to my car at the end of the night, a car full of people followed me slowly and finally drove off when I got in my car and started it. In a video of their sermon the week before, one of the pastor’s said, “We must drive back this demonic attack from our city” language during the prayer. And also note the territorial language in their characterization of my visit. There’s a lot to comment on here. But I want to focus on a particular issue that’s been on my mind. Let’s talk on a meta-level about what’s going on when someone like me tries to give a carefully reasoned argument for why someone like the believers who showed up to my talk should stop believing. First, the Salem Witch Trials argument that I’ve been presenting for some years now, and in my book, is, as far as I can tell, a devastating argument against anyone who thinks that there is adequate historical evidence to justify believing in the resurrection. No false modesty here. The point is that if the really sketchy historical information we have about Jesus warrants concluding that he was resurrected, then the evidence we have concerning witchcraft at Salem, which is vastly better by any measure of quantity and quality, warrants us in concluding that there were really witches at Salem. But, of course, there was no magic at Salem. So we should reject both. There are lots more details about this argument in my book. But here’s what I want to get to. First, this sort of argument has almost no effect on the majority of believers who hear it. That is due, in large part to motivated reasoning. This is a well-studied proclivity in humans to acquire a belief, and then evaluate all new information they encounter in ways to make it conform to that belief. Preference inconsistent information is critically evaluated with much more sever skepticism, and preference consistent information is accepted with much less critical scrutiny. That is, if it’s not what we want to hear, we figure out some hyper-critical way to find flaws in it and reject it. We all do it about lots of topics. 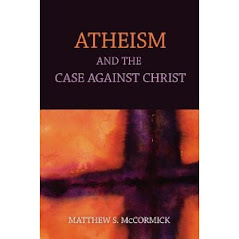 My book full of skeptical arguments about Jesus, not surprisingly, has brought motivated reasoners out in droves. These days, I find the base phenomena of motivated reasoning and the psychology of belief more interesting than actually engaging in the philosophical debate over that Salem argument. The Salem argument is a slam dunk, as I see it. The only question that remains is, what are the real reasons, psychological, social, personal, and neurobiological, that it just bounces off of so many believers? So I want to talk about that part: the body of evidence that folks like the ones who showed up for my talk, take to be resounding proof of God. I’m going to speculate a bit about what that is. First, this group of believers, like many in the U.S., is highly adept at getting themselves into a state of religious ecstasy, for lack of a better term. Watch this bit of video, shot by local activist Dan Pemberton, of them praying. Ok, so let’s take a believer and take the sum of all these ecstatic moments that she’s had as a part of her evidence. What else is there? There’s probably also a number of cases where she’s prayed fervently for something—for a loved one to get better from illness, for someone to overcome drug addiction, for guidance about some important decision, and so on—and then as she sees it, later, the outcome she prayed for happened. A loved one got over an illness, someone recovered from drug addiction, etc. What else? All of her friends and family believe fervently. They are utterly convinced. God existence and God’s presence in their lives is an obvious truth to them. The fact that so many people around her, including lots of people whose judgment she trusts, itself is a part of her evidence. It’s part of what’s leading her to believe. And this makes perfect sense. We all look to the people around us for guidance about what to believe. So what would be required to bring someone like this around? Importantly, a person who believes needs to care about believing reasonably, they need to care about the evidence, they must have as a priority something like Hume’s principle: Believe all and only those things that are best supported by the evidence. And believe them with a conviction that commensurate to the quality and quantity of evidence in your possession. And make a concerted effort to gather all the relevant evidence (pro and con) that time, resources, and prioritization requires. Call this set of priorities a Rationality Principle. Obviously, the Rationality Principle is huge. Lots of people don’t have it as a priority. Lots of people don’t understand parts of it. And lots of people fail to see how central it is to their achieving lots of their goals. So a real discussion with a believer that has the goal of getting them to not believe may just turn into a broader, and more fundamental discussion of why she ought to adopt or care about this principle. The problem with this piece that that the writing and the tone here is inflammatory. Even though he’s making a set of very good points about how prayer is set up to be non-disconfirmable, he does it in a way that will offend people and obscure the message. What about the religious ecstasy? I have a number of ideas about what might put those experiences into a larger, natural context for people. They are common in lots of human religions, including ones that make contrary claims to Christianity. So one person arguing for God on the basis of her ecstatic experiences is faced with millions of other people having just the same sorts of experiences but taking them to imply that the opposite is true. People also have these experiences, or something very close to them, at Justin Bieber concerts, during football games, when the national anthem is played, during chick flicks, and so on. They are common, easily induced naturally, and we don’t have any substantial reason to think that the best explanation here is supernatural. So there’s a sketch of what I think is going on in the head of a subset of American Christian believers. That’s an enumeration of their evidence, and some rough suggestions about what it will take to win them, or more likely, their children or their grandchildren over.